With roots to the land and the boardroom, Adams says she's ready to "get 'er done." Leah Hogsten | The Salt Lake Tribune LuAnn Adams and husband Bob ride out to check on 3-week-old calves amid their herd of Angus cattle Saturday, February 22, 2014 at their ranch in Promontory. The former Box Elder County Commissioner, LuAnn Adams, is the new commissioner of Agriculture for Utah and the first woman to hold the post. Adams is a self-described cowgirl whose favorite thing is to ride horses, travel in an antique buckboard wagon and cook Sunday dinners for her five children and 12 grandchildren. 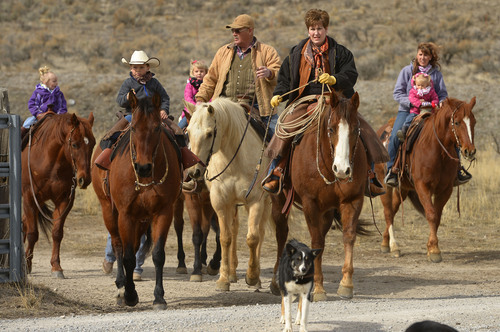 Leah Hogsten | The Salt Lake Tribune LuAnn Adams and husband Bob ride with their grandchildren, from left, Brynlee, 2, Hayden, 5, Kylee, 3, and daughter-in-law Jenny, holding TayCee, 2, Saturday, February 22, 2014 at their ranch in Promontory. The former Box Elder County Commissioner, LuAnn Adams, is the new commissioner of Agriculture for Utah and the first woman to hold the post. Adams is a self-described cowgirl whose favorite thing is to ride horses, travel in an antique buckboard wagon and cook Sunday dinners for her five children and 12 grandchildren. 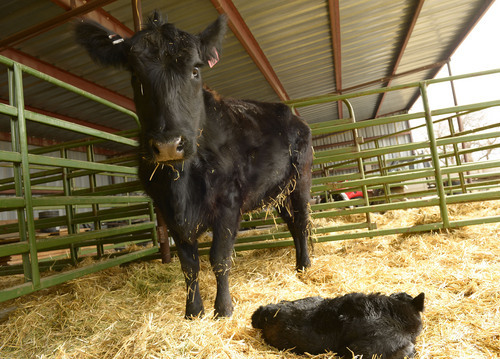 Leah Hogsten | The Salt Lake Tribune An Angus heifer and her newborn calf at the Adams family farm in Promontory, Saturday, February 22, 2014 at their ranch in Promontory. The former Box Elder County Commissioner, LuAnn Adams, is the new commissioner of Agriculture for Utah and the first woman to hold the post. Adams is a self-described cowgirl whose favorite thing is to ride horses, travel in an antique buckboard wagon and cook Sunday dinners for her five children and 12 grandchildren. 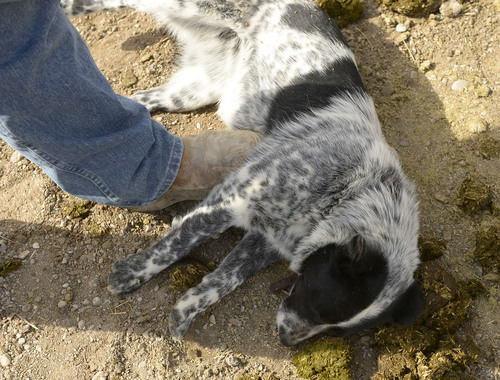 Leah Hogsten | The Salt Lake Tribune Ruthie, a Blue Heeler/Border Collie Mix gets her belly rubbed by Bob Adams while laying her head in horse apples, Saturday, February 22, 2014. The former Box Elder County Commissioner, LuAnn Adams, is the new commissioner of Agriculture for Utah and the first woman to hold the post. Adams is a self-described cowgirl whose favorite thing is to ride horses, travel in an antique buckboard wagon and cook Sunday dinners for her five children and 12 grandchildren. 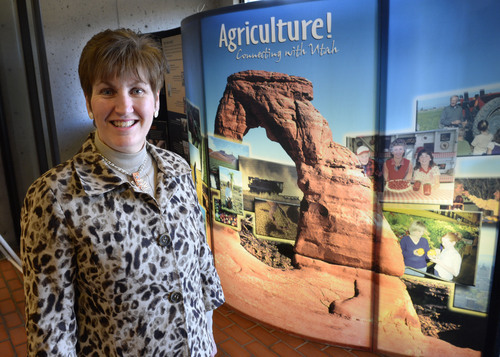 Steve Griffin | The Salt Lake Tribune LuAnn Adams is the new Commission of Agriculture for Utah. She is photographed here at the Utah Department of Agriculture Building in Salt Lake City on Thursday, February 20, 2014. 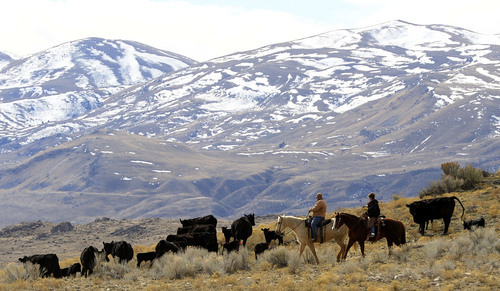 Leah Hogsten | The Salt Lake Tribune LuAnn Adams and husband Bob ready their horses to check on 3-week-old calves amid their herd of Angus cattle Saturday, February 22, 2014 at their ranch in Promontory. The former Box Elder County Commissioner, LuAnn Adams, is the new commissioner of Agriculture for Utah and the first woman to hold the post. Adams is a self-described cowgirl whose favorite thing is to ride horses, travel in an antique buckboard wagon and cook Sunday dinners for her five children and 12 grandchildren. Leah Hogsten | The Salt Lake Tribune Bob Adams places the head stall on Pete, his wife LuAnn's horse Saturday, February 22, 2014. The former Box Elder County Commissioner, LuAnn Adams, is the new commissioner of Agriculture for Utah and the first woman to hold the post. Adams is a self-described cowgirl whose favorite thing is to ride horses, travel in an antique buckboard wagon and cook Sunday dinners for her five children and 12 grandchildren. Leah Hogsten | The Salt Lake Tribune LuAnn Adams and husband Bob ride out to check on 3-week-old calves amid their herd of Angus cattle Saturday, February 22, 2014 at their ranch in Promontory. The former Box Elder County Commissioner, LuAnn Adams, is the new commissioner of Agriculture for Utah and the first woman to hold the post. Adams is a self-described cowgirl whose favorite thing is to ride horses, travel in an antique buckboard wagon and cook Sunday dinners for her five children and 12 grandchildren. 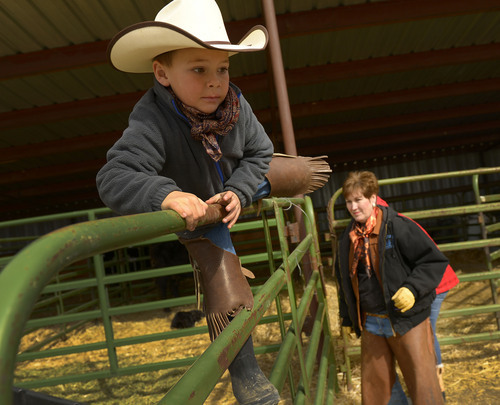 Leah Hogsten | The Salt Lake Tribune LuAnn Adams watches her grandson Hayden, 5, hop into a pen to get a better look at a newborn calf at the family farm in Promontory, Saturday, February 22, 2014 at their ranch in Promontory. The former Box Elder County Commissioner, LuAnn Adams, is the new commissioner of Agriculture for Utah and the first woman to hold the post. Adams is a self-described cowgirl whose favorite thing is to ride horses, travel in an antique buckboard wagon and cook Sunday dinners for her five children and 12 grandchildren. 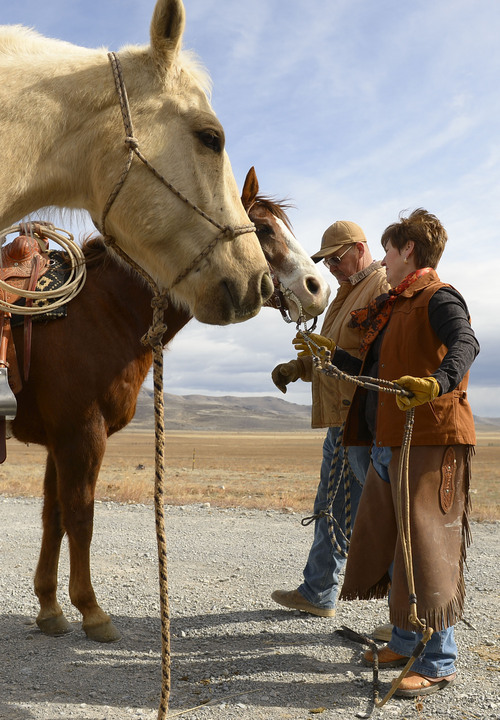 Leah Hogsten | The Salt Lake Tribune LuAnn Adams holds tack for her horse before going on a short ride with her family on their ranch in Promontory, Saturday, February 22, 2014. The former Box Elder County Commissioner, LuAnn Adams, is the new commissioner of Agriculture for Utah and the first woman to hold the post. Adams is a self-described cowgirl whose favorite thing is to ride horses, travel in an antique buckboard wagon and cook Sunday dinners for her five children and 12 grandchildren. Promontory • It&apos;s a good thing that LuAnn Adams is a multitasker with a "get &apos;er done" attitude. As Utah&apos;s new commissioner of agriculture and food, she oversees 200 employees from eight state divisions responsible for  among many things  livestock grazing; weed eradication; soil conservation; meat and poultry safety; homeland-security issues; and even some consumer-protection policies, such as ensuring that the gas pump fills your tank with the correct amount of fuel. Having an impact on so many aspects of everyday life "thrills me," said Adams, who is the state&apos;s seventh agricultural commissioner  and the first woman to hold the job. Adams was a Box Elder County commissioner from 2011 until December, when she was appointed by Gov. Gary Herbert. She replaces Leonard Blackham, who retired after nine years in the position. The state Senate confirmed Adams&apos; nomination last week. Before that, though, she was meeting with farmers, ranchers and lawmakers to talk about immigration, sage grouse habitat and other issues facing Utah&apos;s agricultural landscape. Adams takes over the department at a time when there is high interest in farming and food production. Statistics show that in 2012, Utah&apos;s farm income reached $1.8 billion, a jump of 28 percent since 2007. The number of farms in Utah also grew in that five-year period, from 16,700 to 18,027, according the federal government&apos;s 2012 Census of Agriculture report. Actual acreage has not increased, however, because of urban sprawl. "They are mostly smaller farms catering to niche markets," Adams said of the new farms. "But the numbers are still exciting." Women also are playing a bigger role, becoming the principal operators of more ranches and farms. The newest census numbers show that women operated 11.2 percent, or 2,018, of all Utah farms, an increase of 4 percent from 2007. That makes it a good time for Adams  a self-described cowgirl whose favorite thing is to ride a horse, travel in an antique buckboard wagon or cook Sunday dinner for a crowd  to take over the state&apos;s agricultural reins. 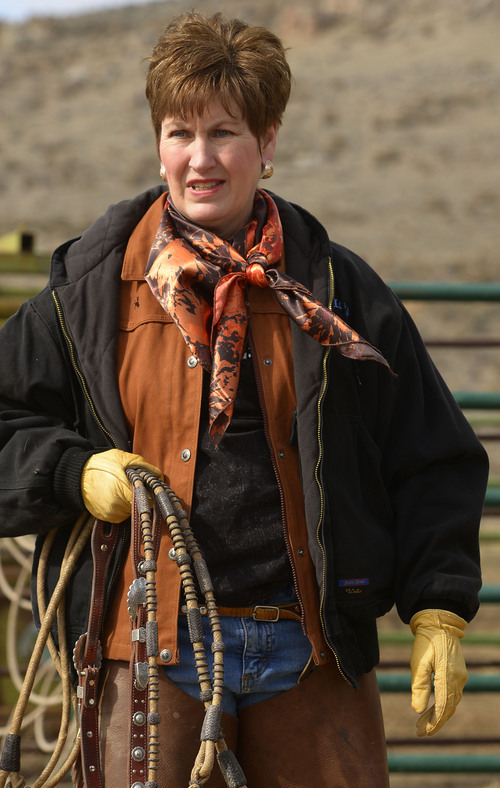 While being the first woman in any post is significant, Adams doesn&apos;t find a need to dwell on the distinction, especially coming from a ranching family in which both genders have always pitched in equally to guarantee survival. 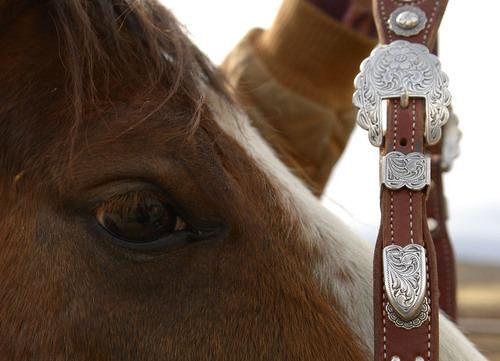 "Our daughters and daughters-in-laws rope and brand and ride as well as any of the men," she said. "I&apos;d put them up against any guy." Herbert thought the same about Adams, saying she "brings the right mix of understanding of the agriculture industry and critical leadership skills to the job." Or, as Adams says, "I&apos;m a get &apos;er done kind of person." "She can&apos;t wait to dive in and get to work," said her son Ben Adams. "She likes to make work for herself." Born on a potato farm in Idaho, Adams moved to Wells, Nev., at age 11 so her father and brother, a pharmacist, could operate a drugstore. While she lived in town during the school year, the summers were spent with friends on nearby cattle ranches. It was there that Adams developed a love of the land and cattle ranching. "I told my mom I was going to marry a cowboy, and guess what? I did," she said of her husband, Bob, whose 1,000-head cattle ranch and dry farm in Promontory have been in the Adams family for three generations. 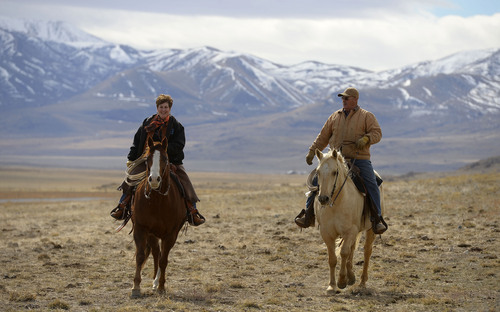 With ATK Aerospace Systems directly east and the historic Golden Spike railroad to the west, it may not look like the scenic Western ranches in the movies, "but I think it&apos;s beautiful," said Adams last week as she and her family jumped on the horses and checked on 100 new calves. LuAnn and Bob now live in Brigham City after passing much of the day-to-day operation to the family&apos;s fourth generation, which includes their two sons and three daughters  all of whom live in Box Elder County. She has 12 grandchildren. Ranching is only part of Adams&apos; life. She&apos;s also been involved in government for nearly 20 years. Beginning in 1995, Adams served as the Box Elder County recorder and clerk. Later she took on property and geographic information system duties when the country surveyor retired and the job duties were combined. "I did that for 16 years and decided to slow down a bit and run for County Commission," she joked. Stan Summers served on the Box Elder County Commission with Adams, and even though the position is part time, he said Adams invested more than 40 hours a week on the job. "We called her the Energizer bunny on steroids, because she goes and goes and goes and goes." Summers, who lost to Adams the first time he ran for the commission, said he and Adams didn&apos;t always agree on issues but "we could also talk about stuff and come to a consensus and not have problem with each other later." Summers said he is grateful for some advice that Adams offered when he was a new commissioner and overzealous about making immediate changes. "She told me to circle the herd. Wait and see what needs to be done. Then make adjustments," he said. "It was good advice." When Adams left to take the state job, Summers gave her a memento for her desk that reads, "Always circle the herd." During her commission tenure, Adams was considered a consensus builder, helping to resolve Bureau of Land Management grazing issues. She also was heavily involved in the state&apos;s sage grouse committee, two issues she will continue to deal with in her new position. Last year, federal wildlife officials proposed that the sage grouse be listed for protection under the Endangered Species Act (ESA), a move that could affect the state&apos;s grazing, farming and ranching economies, said Matt Hargreaves, Utah Farm Bureau vice president of communications. In hopes of avoiding the federal listing, private landowners have worked to conserve and improve the habitat. "We want to help the habitat and build it up so it doesn&apos;t need to be listed," said Hargreaves, noting that Adams will play a key role in helping the state make its case to federal officials. Fortunately, he said, "She doesn&apos;t seem intimidated." Adams also will increasingly deal with ways to help small farms meet the strict federal food safety standards without breaking their pocketbooks and putting them out of business. It&apos;s an issue that has come up recently in the egg and poultry community. "We need to keep those regulations in place to have safe food," Adams said. "But there&apos;s a market out there and we need to work and come up with a solution."